Father, When I think about how blessed I am, I become overwhelmed with emotion. Oh Your blessing is precious and it encompasses me with so much joy and peace. I am just ecstatic that in Your infinite wisdom, You chose me to bless in order that I can be a blessing to others. Amen. Father, It gives me such joy to be a blessing to others. Every time You bless me I in turn bless someone else. It is such a a blessing to be a blessing and brighten up someone’s life as You have done for me. Amen. Father, What more can I say. The love You have for me is exemplified in the abundance of blessings You shower down on me. Your blessing has flung open doors of opportunities I once dreamed about. Now I’m living my dreams blessing after blessing. Amen. Father, I can wait on the blessing as I meander through the process to its manifestation. Along the way, because of Your blessing, I am increasing in patience, character and hope. The person who started the journey is not the person who will finish it. I will am not only be ready to receive the blessing, I will also be able to manage the blessing as well. Thank You for trusting me with the blessing. Amen. Father, Your blessing enables me to overcome every obstacle. I am no longer afraid of the obstacle courses of life because I know that on my way to receiving the blessing I may have to go through some things. But I am reassured that I am blessed in the midst of it all and even more so on the other side of the obstacle course. Amen. So many people do just like I did state that they are highly favored. I remember when I was young and we were getting ready to play a game and the captain of the team selected who they wanted. Those who were considered to be the highly-favored players because of their ability almost always got picked first. Now when it came to baseball I was not a good player. In most instances, I was one of the worst players. Naturally I wasn’t highly-favored to be on someone’s team. God’s favor, on the other hand, is one of those things that are inexplicable. One thing for sure, God’s blessing is inherent in His favor. The blessing of God’s favor enables you to be selected even when there is someone more proficient. Although someone else has been earmarked for a position, God’s favor will automatically cause you to be promoted, even if they don’t like you. His favor is one of those things you should covet. The blessing of God’s favor is priceless and more valuable than silver, gold and all the money in the world. All that you may have felt you lost in the past, the favor of God has the ability to restore it instantly. It causes people to give to you without your ever asking. It catapults you from a prison, as it did Joseph, to the palace. Like Joseph, regardless if you are enslaved, in prison or the CFO of the palace, God’s blessing of favor and increase will be with you. This blessing of favor places you in the hearts of those of influence. They will be naturally drawn to you and seek you out as well as cause them to protect you even against them. Favor is one of those things that can’t be adequately communicated, because you have to experience it.The experience of God’s favor even causes you to be in awe. You know that it has nothing to do with You as much as it has to do with God bestowing his blessing of favor on you just because He wants to do it. God’s favor exemplifies His compassion and abundant love. The children of Israel were favored by God, yet they weren’t always obedient and didn’t always reciprocate that same compassion and love. God never wavered in His favor. Even God’s chastening is favor. He chasten in order for you to be able to reap the abundance of His blessings even more. I am a woman of favor. I walk in the blessing of God’s favor. The beauty of God’s blessing of favor is that it is as much for me as it is for you. Just begin to proclaim decree and declare God’s blessing of favor on your life and experience the abundant life every day. I’d like to share with you how to walk in the God’s blessing of favor on your path to success. Contact me for a free coaching session. The ME Place. Father, Your blessing of favor places me in the presence of those of influence. I know it is because of Your favor doors are flinging open that no man can shut and I am prospering beyond measure in every aspect of my life. Because of Your favor, every obstacle that has been a hindrance has been permanently removed and those who are against me have become the footstool that elevates me to success. I proclaim decree and declare, “I am a person of favor.” Amen. Father, I am more than just a thinker, a wisher or a dreamer. I am a doer. As a doer who takes action Your blessing is on everything I do. Every productive action I take is already blessed simply because I migrated from dysfunction to function. Functioning at optimum performance assures me that I am walking in the abundance of Your blessing every day. Amen. Father, Your favor is inherent in the blessing. You have placed favor on my hands and everything that I do is blessed. I work heartily unto You because Your blessing on my diligent hands makes me rich. Amen. 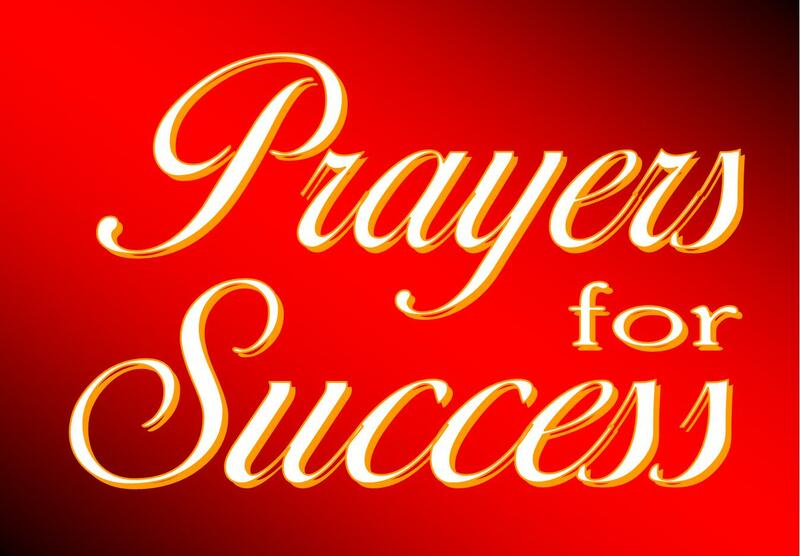 PRAYER FOR SUCCESS: Father, Your blessing causes my mind to be transformed and renewed. I am no longer conformed to a limited mindset. I know You are doing exceedingly abundantly above all I could ever ask or think. I am experiencing great success because my powerful positive thoughts create a world of illimitable possibilities. Amen.